7.12.2005 Founded in the EU-Parliament in Brussels with representatives of 8 parties from 7 countries.They endorsed the “Declaration of Brussels”. 26.6.2006 2nd General Meeting in the Landtag (NRW Parliament),Dusseldorf with representatives of 9 parties from 8 countries. 13/14.10.2006 ENGS was represented at the EGP-Congress in Geneva,Switzerland with an own stand in front of the meeting auditorium. 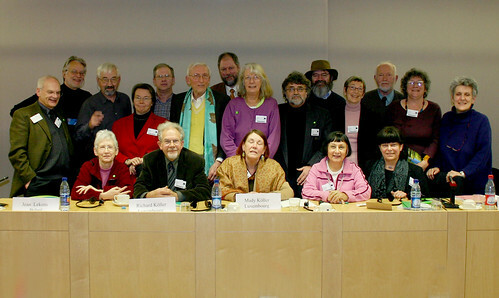 28.-30.12.2006 Executive Committee meets in Vienna as guests of the IGS(Iniative Grüne SeniorInnen) and of the DGS (Die GrüneSeniorInnen) to organize the next general meeting. 18/19.5.2007 Executive Committee meets in Brussels with representatives from 9 parties. First reading and discussion on the ENGS-Manifesto. 12.-14.10.2007 3rd General Meeting in Vienna, combined with a fringe meeting at the EGP Council meeting and a climate change demonstration in the Vienna shopping area, attended for the first time by representatives from Malta, Romania, the Czech Republic and Ireland. 19.-21.12.2007 Executive Committee meets in Mulheim an der Ruhr (Germany) as guests of the Grüne Alten. The ENGS-Manifesto is finalized and the action points for 2008 are defined. 26-27.09.2008 4th General Meeting in Utrecht, the Netherlands. Statutes were approved for ENGS to become a INPO- International Non Profit Organisation. 25-26.03.2009 5th General Meeting in the European Parliament in BrusselsFringe meeting “ Against increasing liberalisation of social services in Europe” . ENGS elected his new “ Board” for the next 3 years. 07.-10.10.2010 Board-and 7th General- and Fringe Meeting at the occasion of the 13th EGP Council in Tallinn, Estonia –Election of 2 new board members and a new vice-chairwoman , Birgit Meinhard-Schiebel and a new treasurer, Ria Kaatee. Presentation of our new website : www.greenseniors.eu , distribution of questionnaires for White Paper, Tony Cooreman congratulated Dr. Wilhelm Knabe, the co-founder of ENGS to his 87th birthday in the hall of the Council. Wilhelms words of thanks included his life with retrospect and prospects for young and old. ENGS welcomes two new ENGS members: France -“Commission Vieillesse et Solidarité entre les Générations”with Jocelyne Le Boulicaut as chairwoman and Spain –“Red de Verdes Mayores ” with the chairwoman Annette Muggenthaler. December 2010 Published by Green European Foundation for ENGS:“Another Ageing for Europe! –ENGS White Paper with Ageing Compass and Happy Ageing Indicators” and the financial support of the European Parliament. General Assembly: We decided to work with a new concept: We get in contact to European Politicians who are responsible for generation policy and wish a good exchange. Fringe meeting Solidarity and Freedom for Europe – clear words, clear position – what holds Europe together?